Thomas Francis University's Degree Program is administered under the direction and tutelage of Dr. Douglas Kelley who has researched and taught human development for nearly four decades. He is the author of scores of courses, books, audios, and concepts on a variety of metaphysical topics. Dr. Kelley has designed the TFU Degree Program especially for busy adults who want the knowledge and degree, but who simply cannot spend several years in getting them (as is normally required with traditional colleges and universities). Our metaphysical degree program is simple and straightforward; we have streamlined it by offering Bachelor's, Master's, and Doctoral degrees in an accelerated format to save you time and money thereby allowing you to use your knowledge and degree much faster than usual. Since our courses are self-paced, the average completion time for all three degrees is 10 to 12 months. Some students complete it faster, some take longer. Each course is divided into segments, much like chapters in a book. The average course has five or six segments, but several advanced and certification courses will have around eight or so. Each segment has written study material in PDF format. Students can download and print the study material for future reference. Some segments feature video and audio components as well as other resources to aid in learning. Most courses have a final exam or quiz consisting of multiple-choice and true/false questions. Many courses also contain a short essay question on the quiz. 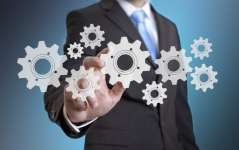 Advanced and certification courses include written assignments as well. Grading is the standard A, B, C, D, F scale. The minimum passing grade is the standard C- (70%). Course content is comprehensive and adheres to high educational standards. Courses are designed to be challenging-but-achievable—even if you haven't taken a course in years. Courses are 100% online and are taken one at a time in the order they are listed on the specific degree program description page (see "Choose Your Degree" on the menu above). A normal desktop or laptop computer is recommended, but students can also use tablets. Just remember that there will be some minimal writing in most courses. Use the device you are most comfortable with. Simply start with Segment 1 by reading the written study material. Study it well enough to get the sense of what it is teaching. Review any supplemental resources such as videos or audios. Then move on to Segment 2, and so on. Once you have carefully and thoroughly studied the material in all segments, you can complete the online quiz and get your Certificate of Completion. You can now move on to your next course. Most of our degree programs require a total of nine courses, five for the Bachelor's degree and four for the Master's degree. You are free to take more than the required number of courses in the Master's Program, if you so desire. 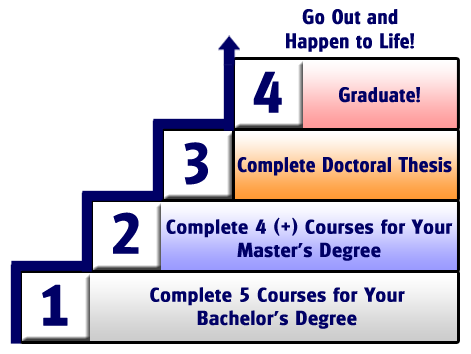 The Doctoral Program and degree requires a written Doctoral Thesis which takes the form of answering several questions about the courses you completed in the Bachelor's and Master's Programs. Once you have completed your first five courses, you will receive your Bachelor of Metaphysical Science degree (MSc.B) and digital PDF diploma. 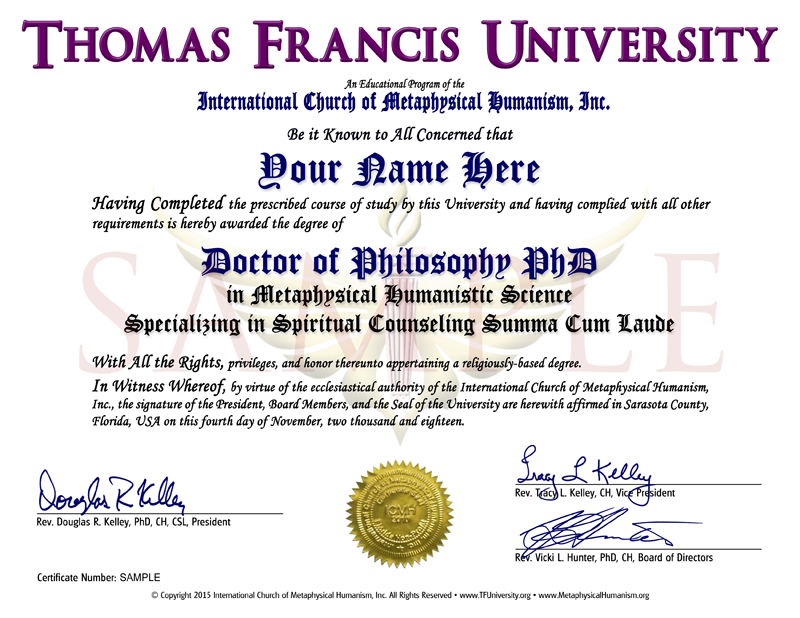 Once you have completed your Master's courses, you will receive your Master of Metaphysical Science degree (MSc.M) and digital PDF diploma. 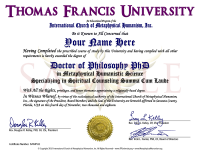 Once you have completed the Doctoral Thesis, you will receive your Doctor of Metaphysical Science degree (MSc.D or PhD) and digital PDF diploma. At this point, you will have completed the entire degree program and will receive digital and printed versions of all your graduation documents including your diplomas and any awards received. You are now free to go out and happen to the world! However, you are always welcome to return to take additional courses, if you so desire. Honor Roll: For students who earn a grade of A+ (96% or higher) on any course during any given quarter. Taking Flight Award: Given to students who have had breakthroughs in understanding and awareness. Exemplary Student Award: Given to students who maintain a teachable and positive attitude toward their studies. International Student Award: Given to students for great performance and whose first language is not English. Golden Flame Award: Given for significant spiritual growth and evolution. Golden Wings Award: Given for outstanding academic performance. Since Thomas Francis University is an online school, it is only logical that our graduation ceremony should also be online. This allows students from all around the world to participate. Graduations are held the first Saturday in May. Any student graduating with their Bachelor’s, Master’s, or Doctoral degree prior to this date may participate. Participation is optional. The Dashboard is the starting point for your studies. Once logged in, it is accessible from the top menu bar. It contains all of your enrolled courses, how-to video tutorials on taking courses, and more. Enrolled students are invited to join our private, Facebook-like social network called OnePlanetCommunity.com. This network allows students to interact with one another as well as with our instructors. Students who focus on spiritual counseling, life-coaching, hypnosis, or holistic healing are invited to join the International Metaphysical Practitioners Association (IMPA) upon graduation. A nominal life-time membership fee applies. Students who focus on anomalous research, Ufology, or Cryptozoology are invited to join the ParaNexus Anomalous Research Association upon graduation as Certified Members. Membership is free.